As a bookseller we have a lot of books pass through our hands. But we are also collectors. And as collectors, sometimes we handle an item that is worth talking about, even if we are not offering it for sale. Hence this post about a truly exceptional British first edition of The Second World War. 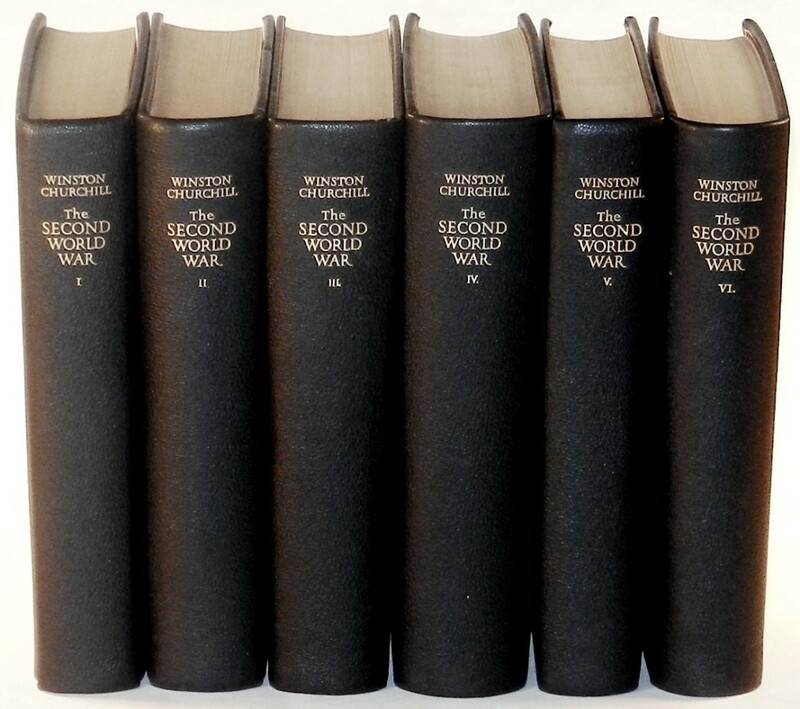 Most of us are familiar with the six-volume British first edition. The British first edition of Volume I was published in October 1948, the sixth and final volume in April 1954. British first editions were issued in black cloth bindings stamped gilt on the spines with uniform dust jackets featuring varying color print and uniform red spine sub-titles on a grey background containing alternating rows of rampant lions and Churchill’s initials. Though truly fine copies are quite rare, jacketed sets in flawed condition are not uncommon. Not so the handful of original first edition, leather bound presentation sets. “One hundred sets” are noted by Frederick Woods as “bound by Cassell in full black pebble-grain morocco for presentation.” These are elegantly handsome, with first printing contents including original trade edition endpapers, gilt on the top edge, head and foot bands, gilt ruled turn-ins, and gilt author, title, and volume number spine print. Such sets are quite scarce and coveted. Sir (Walter) Newman Flower (1879-1964) already had three decades’ experience as an accomplished editor and publisher when he purchased the book-publishing part of Cassell in 1927 from Lords Camrose and Kemsley. Flower retired from Cassell in 1946, passing the reins to his son, but remained Chairman of the Board. The two caveats reflected the advice of Churchill’s lawyers and the author’s characteristic hard-nosed (even ruthless) negotiating when it came to extracting value for his writing. Nonetheless, the agreement set the stage for Cassell’s publishing triumph. Of course Churchill would inevitably write his war memoirs, and of course Cassell would do what it took to accommodate Churchill’s expectations. Among other things, Churchill’s six-volume work proved the essential asset to Cassell’s postwar recovery. 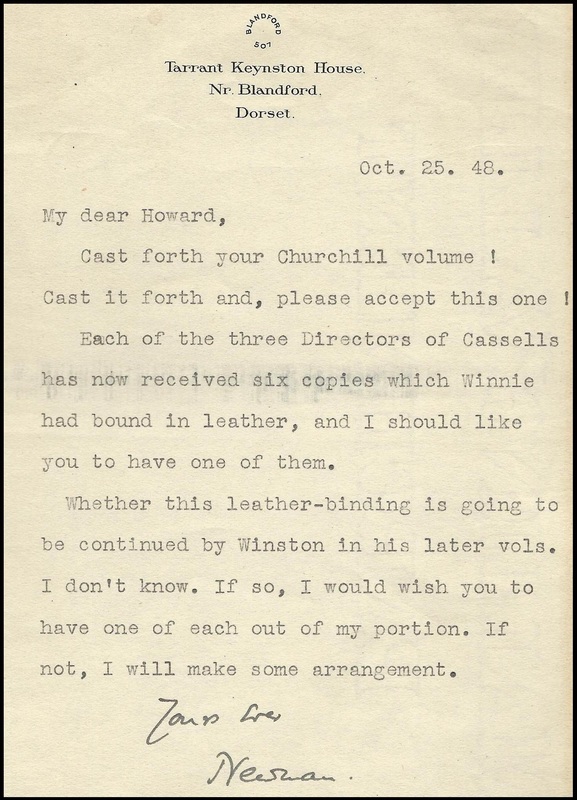 Churchill Bibliographer (and newly-minted MBE “for services to British history”) Ron Cohen speculates that the recipient of this set might well have been Howard Dare Denny, who was the third Manager of Cassell’s Australia. Denny served as Manager from 1924 to 1947 and died in 1960 – late enough to have received all six volumes of The Second World War. Ron speculates that “it would be quite logical to suppose that Sir Newman Flower, who was a major figure at Cassell’s London offices over those same two plus decades, would have written such a personal note” to Denny. Both men were succeeded by their sons, Denny’s son Cyril Dare Denny taking over Cassell Australia operations in 1947. It is worth regarding that this note from a Cassell Director accompanying Volume I might appear to question Frederick Woods’ original bibliographic report on both the number of copies issued and whether they were bound by the author or the publisher. In the end, we are obliged to defer to Woods, who had access to now-vanished Cassell personnel and publishing records when his own Bibliography was published in 1963. 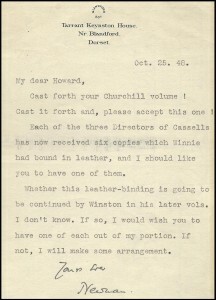 The 18 copies that Sir Newman Flower’s letter specified were for the “three Directors of Cassells” might have been a subset of the 100 total. And even if Churchill did make arrangements for the sets to be bound in black morocco, it is entirely plausible that this work should have been done at Cassell. Nonetheless, the question – raised by a 1948 presentation letter from the man who secured the publication rights – is engaging to contemplate. And the set – beautifully bound, magnificently preserved, and with its inscription and letter – adds a layer of history to that printed on its pages. Three cheers for Ronald I. Cohen, who now adds MBE to the honorifics already due him as Churchill’s bibliographer and President of the Sir Winston Churchill Society of Ottawa, Canada. A brief background may be in order for those of us in the English-speaking world deprived of both Queen and titular recognition. The lists of those who receive hono(u)rs are published at New Year and on the Queen’s official birthday in June. Member of the Order of the British Empire is awarded for a significant achievement or outstanding service to the community. An MBE is also awarded for local ‘hands-on’ service which stands out as an example to other people. 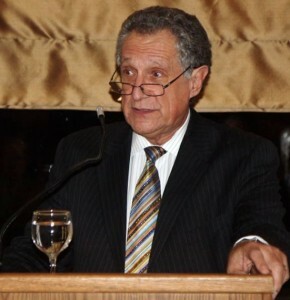 Today Ron will enjoy a well-deserved congratulatory party at the residence of the British High Commissioner in Ottawa. Announcing selections from the unparalleled private collection of Ronald I. Cohen. For our first blog on our new website, we are pleased to announce forthcoming selections from the unparalleled collection of Churchill’s Bibliographer, Ronald I. Cohen. Ron’s may well be the most impressively comprehensive collection of published works by Sir Winston Churchill ever assembled. Nobody knows Churchill’s works better. And nobody owns more of them. Churchill wrote 58 books, 260 pamphlets, and 840 articles. His speeches fill 9,000 pages. His published works appear in a dizzying myriad of editions, issues, states, and printings. And beyond works authored solely by him, Churchill’s words appear in a host of works by others – in the form of letters, chapters, forewords, introductions, prefaces, and similar contributions. Fortunately for collectors, Ron literally wrote the book on Churchill’s published works. 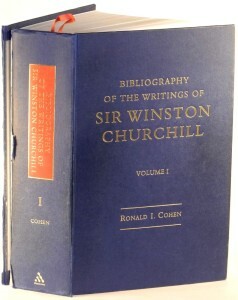 Nearly 25 years of exhaustive research went into his indispensible three-volume, 2,183 page Bibliography of the Writings of Sir Winston Churchill. 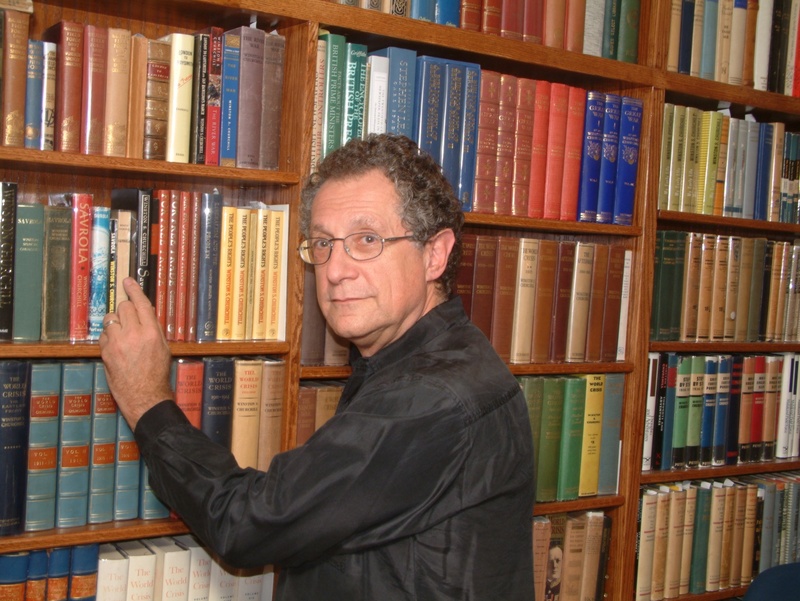 No less an authority than Sir Martin Gilbert effusively praised Ron’s work, calling it: “…a high point – and surely a peak – of Churchill bibliographic research… adding not only to the bibliographer’s art, but to knowledge of Winston Churchill himself.” Published in 2006, Ron’s Bibliography seeks to detail every single edition, issue, state, printing, and variant of every printed work authored by, or with a contribution from, Winston S. Churchill. Above is our copy of Volume I. With its broken binding, soiled covers, and liberally annotated contents, it may be the ugliest book you will ever see pictured on our website. It is also among the most valued and certainly the most frequently consulted. As impressive as his Bibliography is, Ron has spent even more decades seeking to *obtain* copies of each and every item in his Bibliography. We believe that he has come closer to accomplishing this goal than any other collector. Of course, Ron accessed hundreds of institutional and private collections in order to personally examine each publication detailed in his Bibliography. However, discerning collectors will note the impressive number of times Ron is able to reference items from his own collection in his thousands of bibliographic entries. The only known jacketed first edition set of The River War, which is also signed and dated by Churchill in the year of publication. 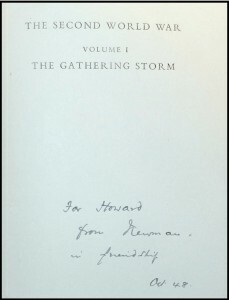 What may well be the last book ever signed by Churchill, signed just eight weeks before his death in January 1965 (which we will soon offer for sale). The broadest and most representative collection of speech pamphlets, including potentially unique items such as the Far Eastern publication of Churchill’s speech on the Fall of Singapore. Every volume of Hansard with a speech by Churchill, including his maiden speech, his five Budget speeches, and his wartime speeches. After many decades of acquiring, Ron is paring his collection. Liquidation of select items from Ron’s collection offers collectors a truly unique opportunity. In the coming months, we will offer hundreds of items from the Cohen Collection. These items are chiefly either signed/inscribed items or editions of which Ron has more than one copy. The many hundreds of “spare” items in Ron’s collection are more numerous than most serious collectors’ primary collections. First notification of available items will be to those subscribing to our contact list, beginning a few weeks hence. We hope you enjoy reviewing the items offered as much as we have enjoyed preparing them for your consideration.